Yesterday I posted about my Cold War Clara cosplay, which is about 98% handmade. Today, now that all the items are in, I am posting about my (not yet aired) Nightmare in Silver Clara cosplay. Unlike most of my other cosplays, which are 90-99% handmade (except for mostly shoes), this cosplay is 95% purchased. That is largely because I managed to find most of the screen accurate items around the internet. 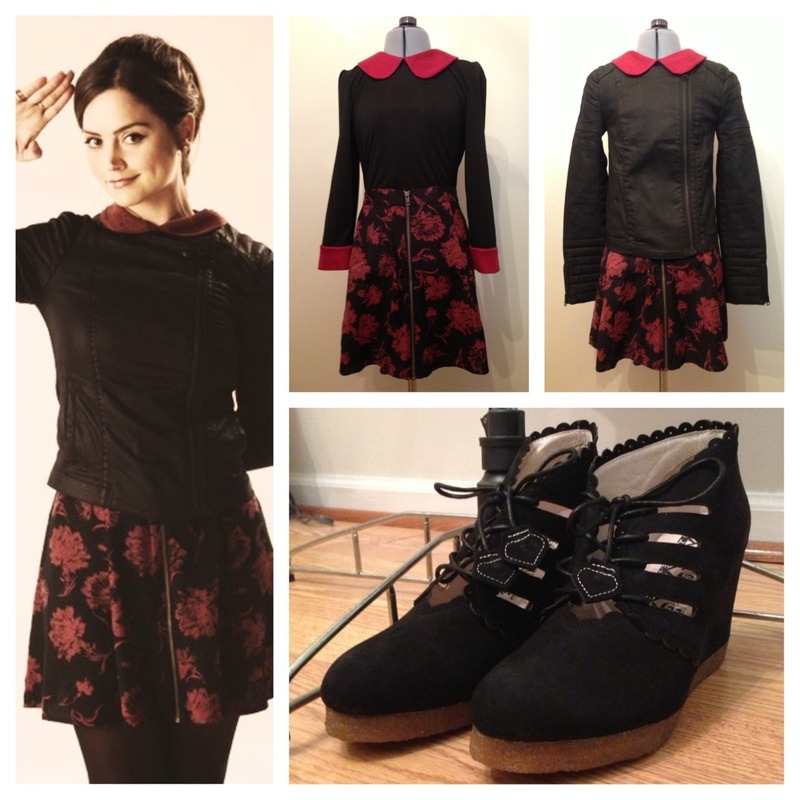 This is one of my favorite of Clara’s outfits so I had to find as many of the items as I possibly could. The one downside is that the majority of the items were a) super expensive and/or b) really difficult to find. But I managed to get them all! Starting with the jacket, this is the All Saints Axelle denim jacket. I believe it retailed for close to $500 in stores, but I managed to snag it on eBay for $150 (including express shipping). My jacket came from Turkey, which is the origin of manufacturing for the jacket. The only real difference I can see from the in store jacket and this one is that the tag is slashed; other than that, it appears to be exactly the same. For anyone who is considering getting this jacket, keep in mind it is a very slim fit. I normally wear a US size 2/UK size 6 on top but had to get a US 4/UK 8 in this jacket to be comfortable. The skirt is from Urban Outfitters UK. It was advertised as “Sparkle and Fade carnation zip front skirt” but the tag says Silence+Noise. Er….anyway, I bought the last one and have not seen it on any other website nor on eBay. I had to buy a large because I wanted it so badly. UK women must run smaller in their sizes because it wasn’t as big as I thought it was. I still had to take in the waist by 2 inches, but I was expecting much more than that. And this skirt is SHORT, at least for my tastes. Good thing I am wearing tights underneath. The shoes were purchased off ASOS and are the F-Troupe wedge heels Clara also wears in Hide. These don’t come in half sizes and with my wide feet I had to size up to an 8. They are a bit large but not too much. There is a 3.5 in heel so I feel a little taller. Clara’s tights are pretty generic. Mine are black opaque tights I bought from Urban Outfitters UK for a little under $5 when I bought the skirt. The undershirt is the only thing I made. It is speculated that the undershirt is Sessun’s contrast collar and cuff shirt, which retails about $120. I can’t find it anywhere and I wasn’t going to pay that money for it considering I got everything else for at least 50% off. Instead I made it from black and dark red knit fabric. The only real items I lack to make this cosplay complete are all the crazy rings Clara wears. She wears so many plain band stacking rings; I only have 2 of them and have been scouring Etsy to find some inexpensive stacking rings. I found some but am having difficulty talking myself into buying them since I over spent this month. In any event, this cosplay will also debut at Animazement at the end of the month. I cannot wait to wear it! This entry was posted in Doctor Who and tagged clara oswald, clara oswin oswald, cosplay, doctor who, doctor who cosplay. Bookmark the permalink. You mentionned you had 2 of her “so many plain band stacking rings”, are those SA ? Have you purchased them afterwards or did you already own them? If so, where did you purchase them ? Asking because I am on the lookout for her jewelry, and would very much appreciate to know where you bought yours (even if sold out, I always can scour the internet just in case). Of course, no problem. Look in the near future for a post about Clara’s Bells of St. John replica dress I made last month. Sure! I am a 32-26-37 (inches). Normally I am a US 2/UK 6 on top. But the AllSaints jacket is slim fitting so I went up to a US 4/UK 8 and it is a perfect fit (a little snug in the shoulders, but mind are a touch broad). Also, hip measurements may not make that much for a deal with this jacket; it sits only about an inch below the natural waist. My hips are a bit wide as you can see but that did not affect the fit at all. Thank you, that’s great! 🙂 I think I’ll get the UK 8. Thank you very much! Hey! I am looking to recreate the skirt, any chance you could tell me how long the skirt is? I designed a fabric to mimic the one they used, just need to make sure I have all the facts! Thank you. Also, what kind of pattern would you recommend? I am not really much for sewing but I am starting out, so! I haven’t measured my skirt, but I think it is about 15-16″ from top to bottom. The skirt hits Jenna about mid thigh; the best thing to do would be to make your skirt approximately the same length. I’m about Jenna’s height and that’s where the skirt hits my leg. But if you’re taller and try to replicate the skirt measurements, you’re going to end up with a very short skirt. As for a pattern, this Simplicity pattern is a good start. I’ve used it for a similar skirt, but you may have to modify it just a bit. The pattern sits close to the hips and the NiS skirt is more swish-y. Just put a zipper in the front where the seam is supposed to be.